Hambantota, Sri Lanka, April 9 (newsin.asia): In a special ceremony held on Monday at the Nonagama Cultural Centre in Ambalantota, Mahinda Amaraweera, Minister of Fisheries and Taranjit Singh Sandhu, High Commissioner of India, jointly launched a project to provide livelihood support to nearly 70,000 people from the farming and fishing communities in Hambantota District. The project envisages supporting livelihood activities by providing useful tools and equipment to the beneficiaries. In particular, 7000 bicycles, 1000 sewing machines and 60000 grub hoes are being disbursed to beneficiaries. the Ceylon Fisheries Harbours Corporation is the implementing agency for the project and Government of India has provided LKR 138 million (US$ 887,340) in grant assistance for this purpose. It is expected that close to 70,000 persons/families will be able to improve their incomes and enhance their livelihood, thanks to this project. Speaking on the occasion, High Commissioner Sandhu emphasized the importance of capacity building and recalled the numerous projects being implemented all over Sri Lanka with Indian assistance. He reiterated India’s readiness to continue to assist Sri Lanka wherever possible and whenever needed. He highlighted the enormous strides made by India in the field of agriculture, and offered to share expertise and technical assistance in this sector. Minister Amaraweera thanked India for its support for this important project. This project is in continuation of Government of India’s commitment to assist the Government of Sri Lanka as part of our bilateral development partnership. India’s overall commitment for development assistance to Sri Lanka stands at a total of around US$ 2.9 billion, out of which US$ 545 million is pure grant assistance. 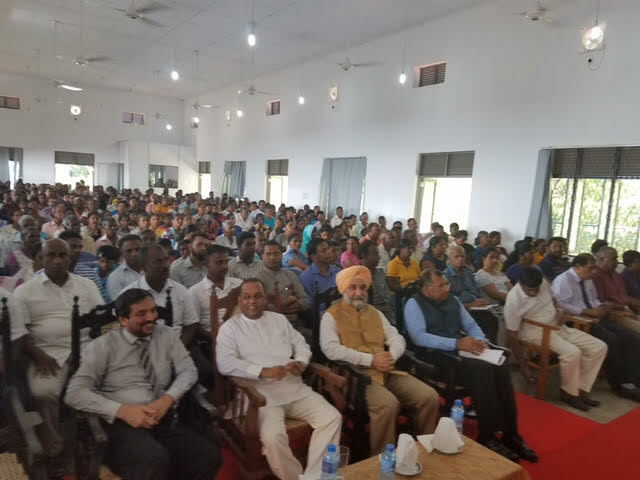 The Secretary to the Ministry of Fisheries and Aquatic Resources Development, Jagath P. Wijeweera, Chairman Ceylon Fisheries Harbors Corporation, Amarananda Abeygunasekara, senior Leaders from the Southern Province, Officials from the Government of Sri Lanka and a large number of beneficiaries attended the function.